Inspire the budding scientists in your life with science stories and inquiry adventures. ‘Tis the season to inspire the budding scientists in your life with science stories and inquiry adventures. Whether it’s learning the basics of rocket science (for babies), exploring the diversity of life on earth, or soaring into the solar system, these children’s books are a perfect launch pad for exploration. We’ve also brainstormed some activities to do at home or in the classroom with the curious kiddos in your life after you’ve finished reading (and Science Friday’s Team Educate has plenty of other resources for you, too). 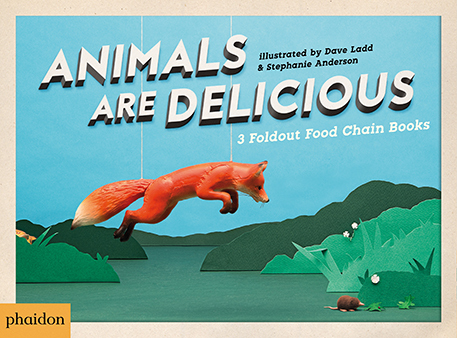 Everyone is hungry in Animals Are Delicious by illustrators Dave Ladd and Stephanie Anderson. So, what do they eat? Take a visual journey through three different food chains: forest, sky, and ocean. For example, what does a shrew eat? 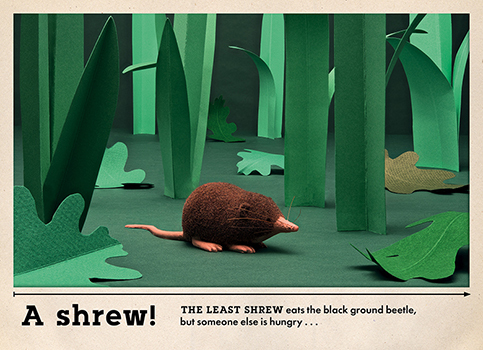 In one food chain, a shrew eats a black ground beetle, but someone else is also hungry…for the shrew! Kids can enjoy taking a storybook-style journey through each food chain, or they can stretch them out all the way and pick out similarities and differences between the food chains. The images created by Ladd and Anderson, which are made from a combination of mixed media “sets” and figurines placed in paper, are whimsical and reminiscent of dioramas found in a natural history museum. Create more food chains! Start by observing animals in a local park, your favorite nature documentary, or even the animals seated at your dinner table! Work backward in the food chains you observe and research the chomp, gulp, snap, or nibbles that are taken at each stage. Incorporate the arts in this adventure and create a food chain board book of your own. If you enjoy Ladd and Anderson’s papercut style, check out Wild Ideas: Let Nature Inspire Your Thinking by Elin Kelsey and illustrator Soyeon Kim. Why do airplane wings have that shape? 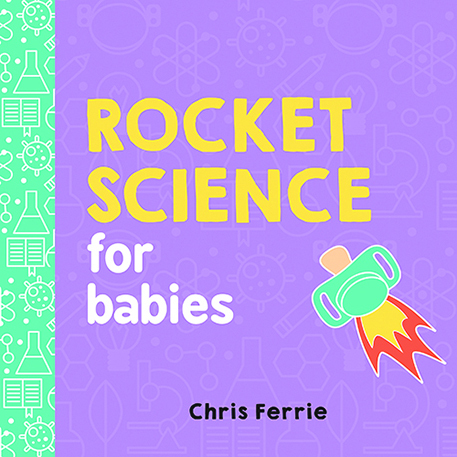 In Chris Ferrie’s Rocket Science for Babies, take a quick look at lift to see why we put wings on a plane or space shuttle. For physicist and father Chris Ferrie, it’s never too early to introduce small children to complex ideas. His Baby University series covers topics like general relativity, Newtonian physics, and quantum entanglement, all for babies! 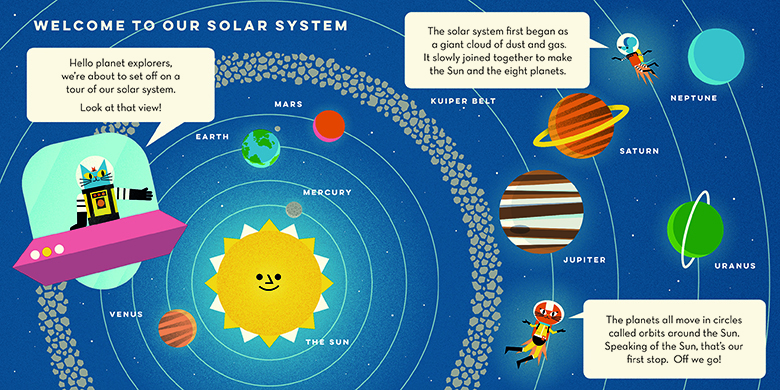 Simple illustrations and simple explanations to launch your future rocket scientist. It’s never too early to experiment with flight. Pair Rocket Science for Babies with some physical props to bring the concepts off the page and into three dimensions. Throw a ball. What happens? Throw a paper airplane. What happens? What is the difference between the two objects? Want more rocket science for babies? Check out Ruth Spiro’s Baby Loves Aerospace Engineering! A curious black spider monkey gets distracted and loses track of his mother. To find her, the lost monkey searches through the creatures of the canopy, the river, and the forest floor. 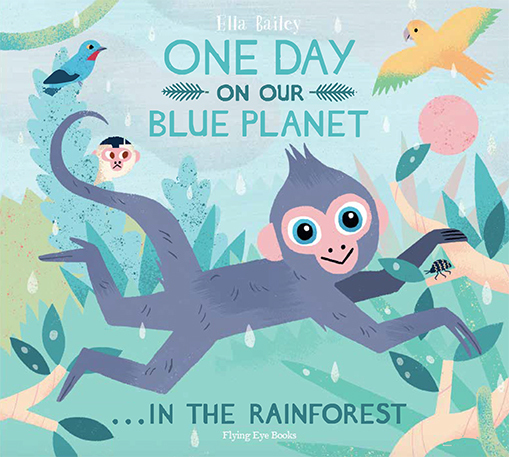 Author/illustrator Ella Bailey’s One Day on our Blue Planet…in the Rainforest is a visual journey through the diversity of the rainforest. 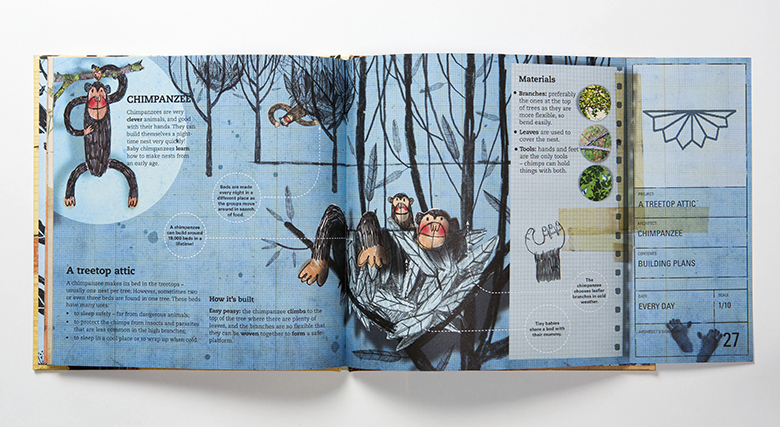 Instead of naming each organism on the page, Bailey’s beautiful illustrated guide (at the front and back of the book) asks the reader to revisit each page and identify the animals the young black spider monkey spots on his search. Get a pair of binoculars and look up into the trees. What different species do you see there? Make a list of creatures and their features. Bailey describes some behaviors of black spider monkeys—go ahead and add some information about the behaviors of the creatures on your list. Having trouble? Use a sheet and a light to go mothing or create a protected pitfall trap to observe some insect diversity. If you like this book, then check out the rest of the One Day on our Blue Planet series— one about the savannah and the antarctic. What is the most indirect way to complete a task? Well, that’s a question you might ask yourself while reading Rube Goldberg’s Simple Normal Humdrum School Day. 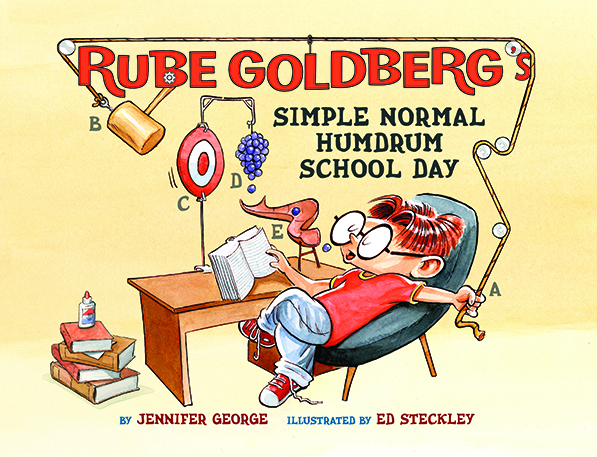 Jennifer George, granddaughter of the cartoonist/inventor Rube Goldberg, celebrates his zany, invention-themed comics by imagining him as a kid running through an average school day. The illustrations of Ed Steckley bounce and rumble along, allowing readers to follow George’s cause and effect descriptions. Explore simple machines by building Rube Goldberg machines. Identify a task you want to accomplish (e.g. turn on a light, pop a balloon, pour water in a cup). Fill a bin with a variety of materials from around your home (blocks, toy cars, tops, etc. ), then use those items to create a machine that completes your task. After your first attempt, try making your machine more complex. Take your tinkering further by making an art machine. Older readers (age 8-12) might enjoy learning about Rube Goldberg machines and the spirit of invention in Ruby Goldberg’s Bright Idea by Anna Humphrey. Did you know that Mars has the tallest mountain in our solar system? 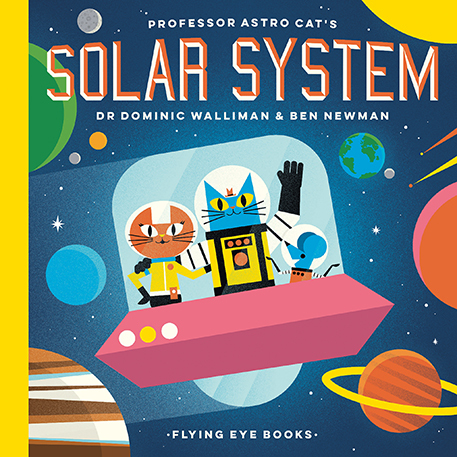 In Dr. Dominic Walliman’s Professor Astro Cat’s Solar System, you’ll follow Professor Astro Cat and his gang on a tour of the planets in our solar system. At each stop, the retro illustrations of Ben Newman pair facts with the familiar, like when our astro cats hide under a disintegrating umbrella in the acid rain of Venus. The book is the latest installment of the Professor Astro Cat series (which has also covered space exploration and physics). Turn your attention to the stars (and planets) in our night sky. Start by learning to identify constellations and the major stars in them, an app like SkyView can be helpful when you’re learning. No need for a telescope yet, a pair of binoculars is a great place to start for most beginning stargazers. If you like this journey, then you might want to take a trip through time with Earth! My First 4.54 Billion Years by Sarah McNulty. You can find nests in the air, in the water, underground, in the mud. 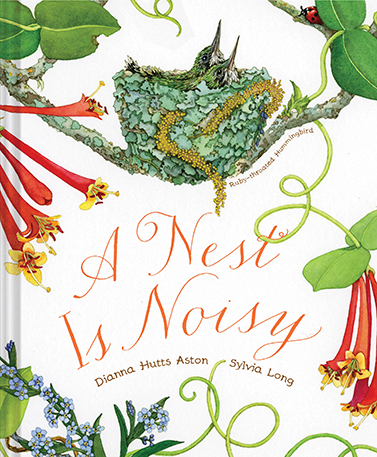 A Nest Is Noisy, created by Dianna Hutts Aston and Sylvia Long, is a visually stunning exploration of the diversity of shapes, sizes, locations, and uses of nests. You might know that sea turtles have nests, but did you know that army ants make “living nests” called bivouacs? Aston’s engaging and fact-filled prose is accentuated by Sylvia Long’s detailed paintings, which come to life on the page. Many scientists keep nature journals where they keep observations and even sketches of the environment they are researching. Get started creating your own nature journal, and try your hand at sketching your subjects. Don’t worry if you’re new to sketching—over time, your drawings will become more sophisticated. You can also practice carefully observing and documenting something that interests you (#ObserveEverything). If you like A Nest Is Noisy, there are five more in the series—explorations of eggs, rocks, seeds, beetles, and butterflies! Let it snow, let it snow, let it snow! 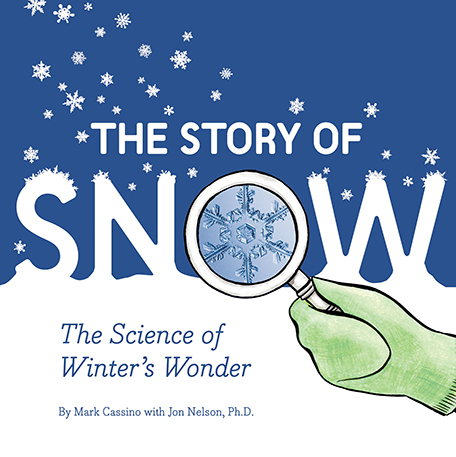 There’s more to snow than white fluff, so take a closer look at your winter wonderland with The Story of Snow by Mark Cassino and Dr. Jon Nelson. How does a snowflake start? Why do they fall? Are all snowflakes six-sided? Cassino and Nelson use a mix of illustrations and images of real snowflakes to inspire readers to take a closer look. They even explain how to catch and observe your own snow crystals! Follow the instructions in the book to capture and observe snowflakes. Go on your own snowflake safari. If you live in a warmer area, you can grow your own snowflakes in a bottle (everyone should try this!) or make supercool fruit pops. For more snow fun, figure out the density of different snowfalls. 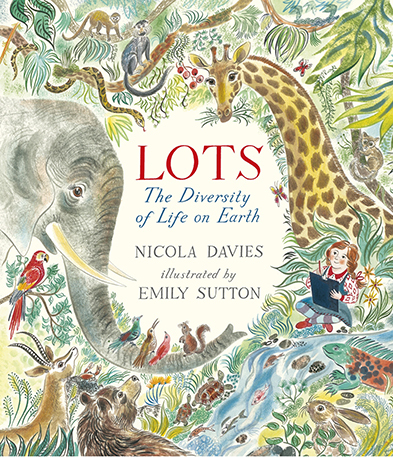 “How many different kinds of living things are there on our planet?” Author Nicola Davies’s Lots: The Diversity of Life on Earth gives us an answer that highlights just how much we’ve seen, and some of what we’ve lost. 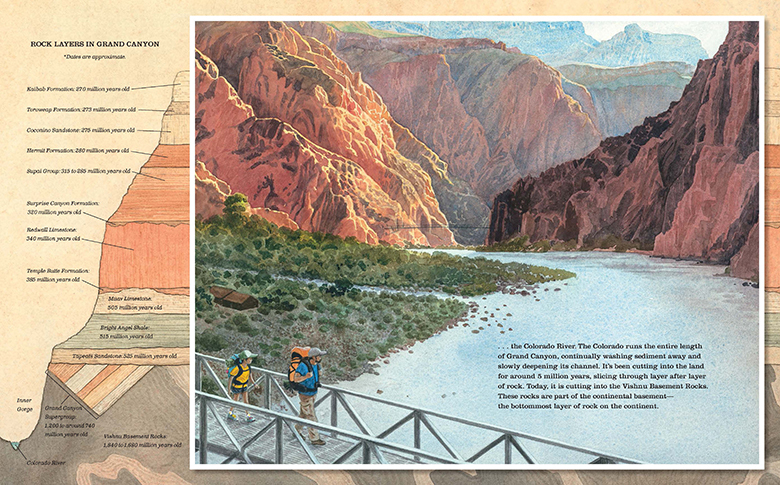 Led by the book’s youthful explorer, kids will enjoy searching high and low and seeing the places they’ve yet to go. Davies leads you on a wondrous journey that closes with a look at human impact on natural patterns and diversity. 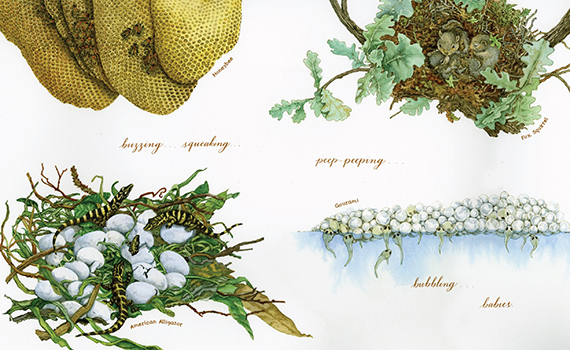 Vividly detailed by Emily Sutton’s beautiful illustrations, Lots: The Diversity of Life on Earth reminds us that we do not and cannot live on a planet of one. Become a citizen scientist! Help advance scientific research by participating in projects in a wide variety of fields (e.g. ecology, astronomy, medicine). SciStarter can help you find a project to participate in or you can begin with recording observations of plants and animals in iNaturalist, an app and website trying to improve our record of biodiversity by empowering everyone to submit observations. If want to read more about the interconnectedness of living things, check out If Sharks Disappeared by Lily Williams. What do hummingbirds, chimpanzees, and termites have in common? Yes, they are animals, but they are also architects! 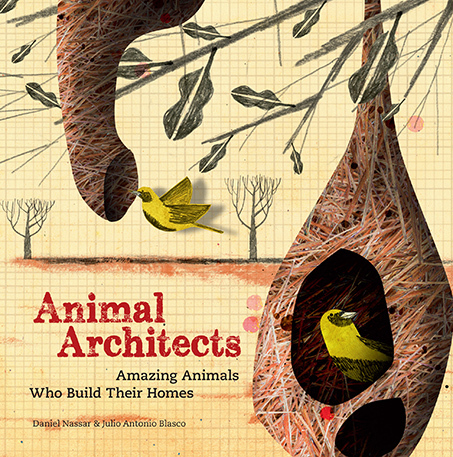 Architect Daniel Nassar and illustrator Julio Antonio Blasco explore 14 amazing homes in their book Animal Architects: Amazing Animals Who Build Their Homes. Ever heard of a caddisfly? During its larval stage, the caddisfly lives underwater and builds a mobile home around its body using hard materials and sticky silk. Blasco’s illustrations are a fun mix of pencil sketches, photos, and mixed-media that highlight the differences in construction while maintaining a consistent organization throughout the book. Kids might particularly enjoy how each construction is compared to a human one, (for example, hummingbird nests are like a tiny apartment). Examine each animal home in the book and identify what the home does for each animal, then discuss how the structure of each home fulfills that purpose. Now try your hand at designing structures with limited materials. Build a spaghetti stick tower that can support one large marshmallow on top or construct a strong bridge that can span 45 centimeters with only straws, newspaper, tape, string, and paper clips. Want more architecture? Check out Iggy Peck, Architect by Andrea Beaty and illustrated by David Roberts. At 277 miles long, more than a mile deep, and up to 18 miles wide, the Grand Canyon is a stunning sight. But it’s more than just rock layers—this canyon is home to a wide variety of organisms, and is a great map of geologic history. 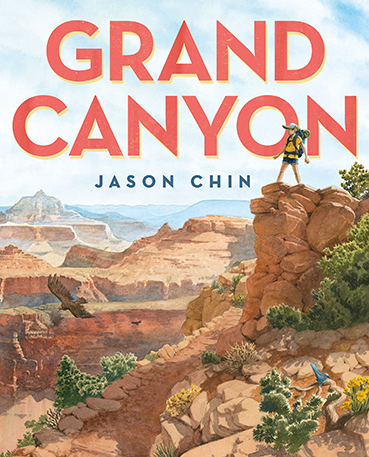 Jason Chin’s Grand Canyon, takes readers on a hike out of the canyon, starting at the hot Inner Gorge and climbing all the way up to the outer rim, ending in the cooler shade of the nearby Ponderosa pine forest. Did you know that there is evidence of dragonflies with 8-inch wingspans in the Hermit formation? Chin’s illustrations transport you back in time, to visualize the history of the canyon held in fossils from the different rock layers. Look at the history of a rock. More complex than you might think, neat rocks tell cool stories. To get started, check out the #neatrocks from Science Friday’s Science Club, take a virtual visit to the Columns of the Giants in California, and interpret the memories found in the mud of Belize’s Blue Hole. Looking for more? Get transported from subway to forest in Jason Chin’s fact-filled, but fictional, Redwoods. A handful of good reads for the shark fans, budding architects, and other curious kids in your life.